The City of Chattahoochee Hills has filed notice with the Fulton County Board of Commissioners that they intend to annex 9,400 acres of land in unincorporated south Fulton (shown below). According to the public notice posted on the City of Chattahoochee Hills website, the land is being annexed using the sixty percent method; meaning that sixty percent of the land owners and sixty percent of the registered voters have signed a petition requesting Chattahoochee Hills bring them into the city. Chattahoochee Hills plans two public hearings on the proposed annexation. The city's planning commission will meet on 30 October 2014 and the full city council will consider the annexation petitions on 4 November 2014. 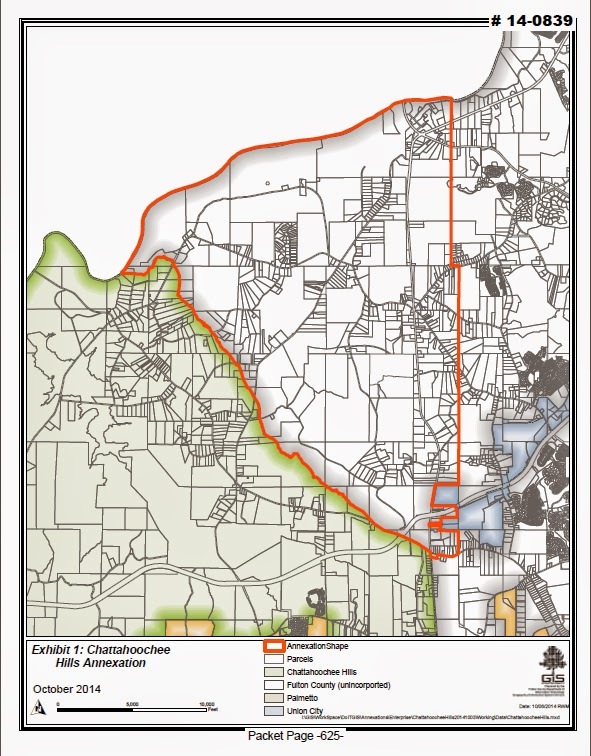 If Chattahoochee Hills is successful in their annexation attempt, the young city's boundaries would be pushed past Cascade-Palmetto Hwy. The 9,400 acres represents the largest land grab by any south Fulton County city since 2007, when a summer of annexation expanded the footprints of Fairburn, Palmetto, and Union City. Such a large annexation would almost certainly raise new questions about the financial viability of the proposed city of South Fulton, which currently includes the 9,400 acres attempting to join Chattahoochee Hills.